Water closet - talk about a way not to talk about that flushing device. Today's toilets may not be a topic for dinner conversation (or they may), but we are passed using euphemisms like water closet. I take that back. Toilets can have "skirts." In fact, I recommend a toilet with a skirt. What's a toilet skirt? It's a toilet base design that hides the trap so that you end up with solid ceramic sides to clean rather than that dust collection device that looks like a ceramic intestine under the toilet bowl. Here's one of Toto's Aquia dual-flush toilets complete with skirt. So why choose a toilet that's harder to clean like this Kohler Wellworth toilet? Traditional design. The sleeker look of skirted toilets can be too contemporary for some bathroom designs. There's a lot more to today's toilets than a (skirted or skirt-less) bowl, tank, handle and flushing device. Dual flush, gpf, Water Sense, ultra low flow, HET - most of the semi-technical jargon deals with water conservation. If you bought your toilet after 1992, it should meet the Environmental Protection Agency's 1.6 gallons per flush (gpf) low-flow standard. 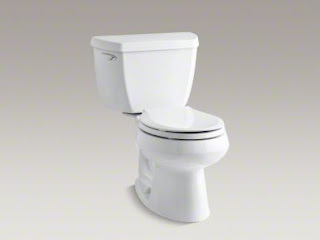 Even so, you can reduce your water usage another 20% by installing an ultra-low-flow or dual-flush toilet that meets the EPA's 2007 WaterSense certification standards for high-efficiency toilets (HETs). 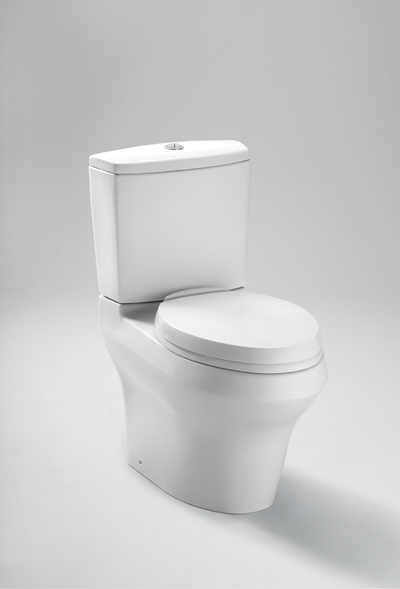 Even if you want a traditional look for a toilet, you can still get lower levels of water consumption. The Kohler Wellworth above uses 1.28 gallons per flush compared to the EPA's current maximum of 1.6 gpf. Dual-flush toilets feature two flush options. Toto's Aquia has .9 gpf for liquids and 1.6 gpf for solids. Today's manufacturers are taking water conservation even further with things like sinks mounted on toilet tanks that use the sink's gray water to flush the toilet. These designs are available both as new toilet/sink combos and as after-market products that add a sink to an existing toilet tank. 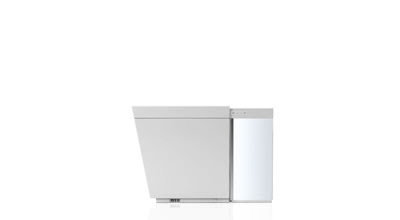 If you want to get into the latest, craziest toilet on the market, check out Kohler's Numi. It's a combination toilet/bidet with a motion detector that opens the seat when you walk up to it, a seat warmer, deodorizer and music (from Kohler's collection, an FM station or your iPod). It also has an air dryer for your tush, and it warms your feet, yes, your feet. Oh, and you can pre-program the remote control so that everyone in the household has his or her customized choices for music, warming, etc. As a dual-flush toilet, the Numi is Water Sense certified to conserve water. I would hope so for $6,390 (retail). Did I mention that it looks like a clothes hamper? And if you're concerned about energy use, those special features add electricity to a fixture that typically does not use it.